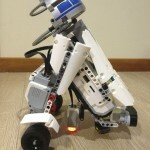 LEGO Mindstorms EV3 R2-D2 | Christoph Bartneck, Ph.D.
Today I finally got some time to play with the new LEGO Mindstorms EV3. 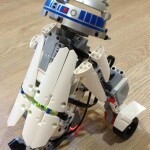 I upgraded my R2-D2 model so that it can now turn its head. This was possible due to the small new motor that comes with the set. EV3 has four inputs and four outputs. But the box unfortunately only contained three motors and three sensors. I also noticed that several very basic LEGO Technic parts, such as the 3/4 connector pin, are not included. On the plus side, there are several 36 Tooth Double Bevel Gears. The EV3 comes loaded with some programs, one of them being an Infrared controller software. I was able to use it directly to control two motors of R2-D2. You can see the USB and SD car slot. Hi Where did you get the Lego mindstorm ev3? Just about to do the lego mindstorm competition next weekend and was thinking about buying another robot. My son and a few class mates are in the competitions and gaining after school access to their borrowed class set seems a bit hard for the teachers to find time to allow them to finish their vision and causing them a major head ache (leaving a group of year 6 boys completely bummed out) , so hence thinking about buying another robot to make it easier for them? So hence, where did you buy yours from, I thought they were going to be released on the 1st August? I am participating in a beta testing program for lego. The sets are indeed not yet available. Can you give me the instructions to build that? I am sorry, the robot has been disassembled for some time. I can only offer you the photographs.